The concept of what is American is a very fluid in nature. We are a nation of immigrants aside from the Native Americans, and our culture is a melange of different ethnic backgrounds. 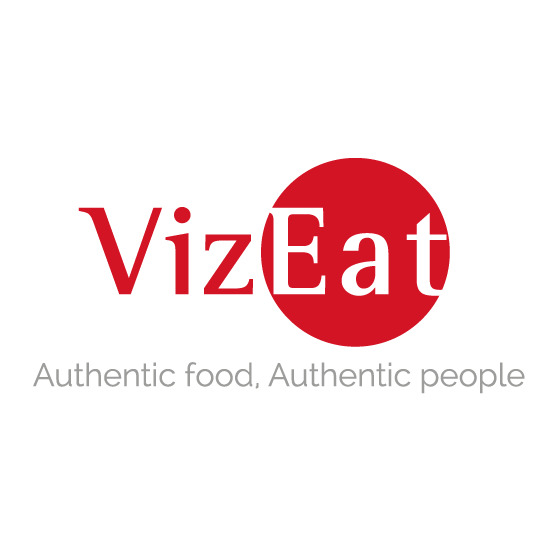 However, one way that each community manages to hold on to their own cultural identity is through food. Therefore, it is often times hard to find dishes that are uniquely American without having roots in another country. Fried chicken is no different. While it is synonymous with down home Southern American cooking and made famous through Colonel Sanders of KFC fame, fried chicken can be traced back to both Scottish and West African culinary histories. Ergo, when both populations arrived in the Southern US, willingly and unwillingly, they brought this greasy treat with them to share with the world. I’ve partook in my fair share of the poultry pleasure whether that is from a chain or an upscale eatery, but nothing like the Chicken Shack in Evanston. My friend David had been talking about this eatery as the place to go for the best fried chicken in the city, so naturally I had to do an investigation. When I pulled up to the restaurant, it actually looked more like a decrepit shack than a glittering monument to fried chicken. How fitting given the name. Usually, a shabby facade could either mean the food is really good or really bad. 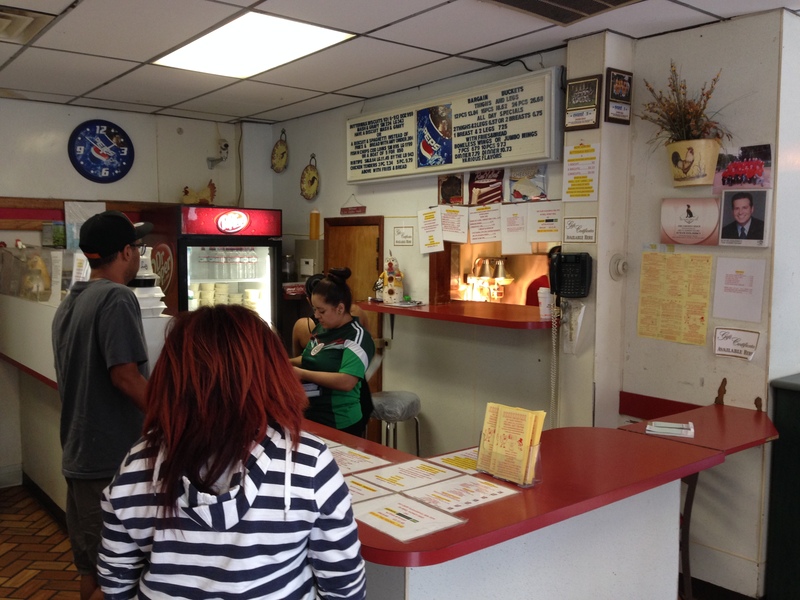 We entered to another bare-bones interior similar to one of my favorite hot dog joints on the Southside. Looking over the menu, they keep it simple at the Chicken Shack with chicken dinners, fish, rib tips, combo meals, and buckets. David and I were feeling hungry, so we got a 12 piece bucket (3 breasts, 3 thighs, 3 legs, 3 wings for $18.14) with some extra hot sauce on the side, and a biscuit for me ($0.92). We took a seat at one of their two tables next to the soda vending machines, and they even had plastic picnic tablecloths to keep the tables clean. After about a 15 minute wait that signified they were making the chicken from scratch in the kitchen, we finally got our box. 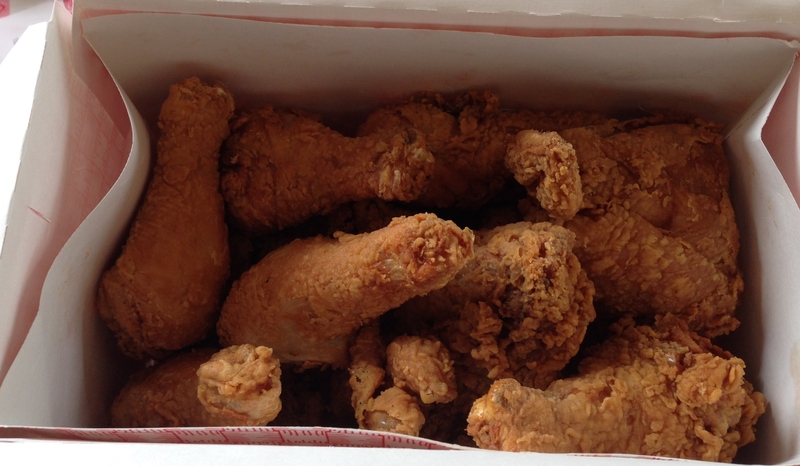 When we opened it, it was a treasure chest of fried goodness. I took a couple pieces out along with my biscuit and decided to try the flaky bread first. 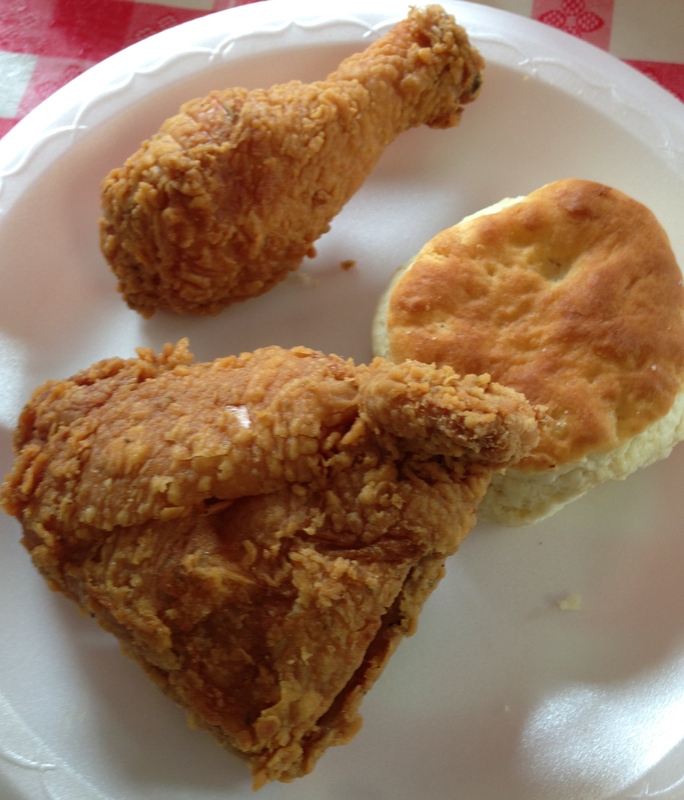 It was fresh, hot, and fluffy, but not as good as the buttermilk biscuits with honey found at Popeyes. Then there were the golden pieces of bird on my plate that I had to greet. As I sunk my choppers into the crunchy, dimpled skin, I was greeted with a mouthful of pure white meat. 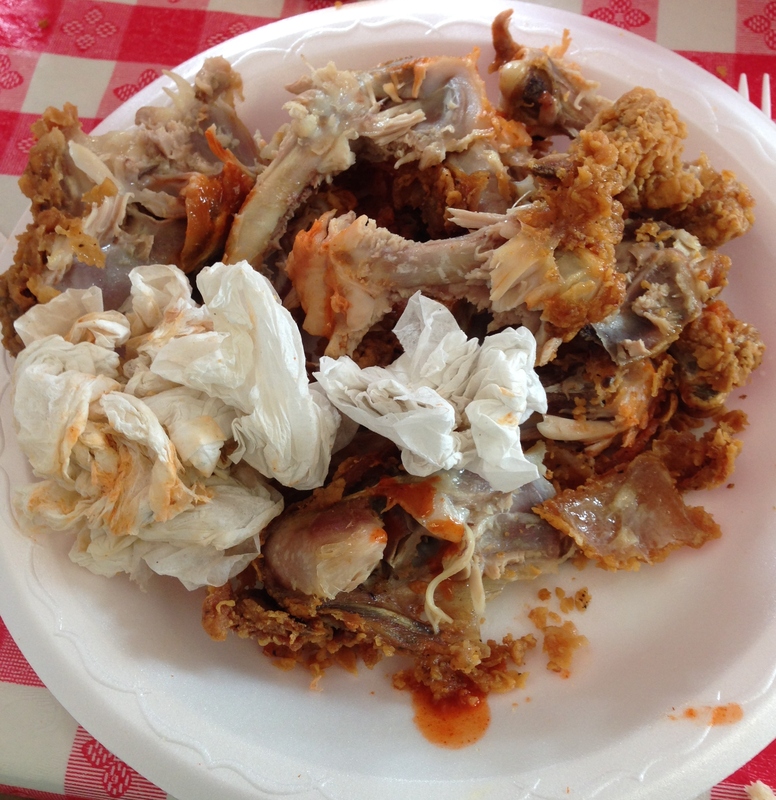 It was only further enhanced by the sour and spicy hot sauce and sweet bbq sauce. Overall, it was solid chicken, but I still prefer the spicy Cajun seasonings at Popeyes over the only mild variety offered at the Chicken Shack. 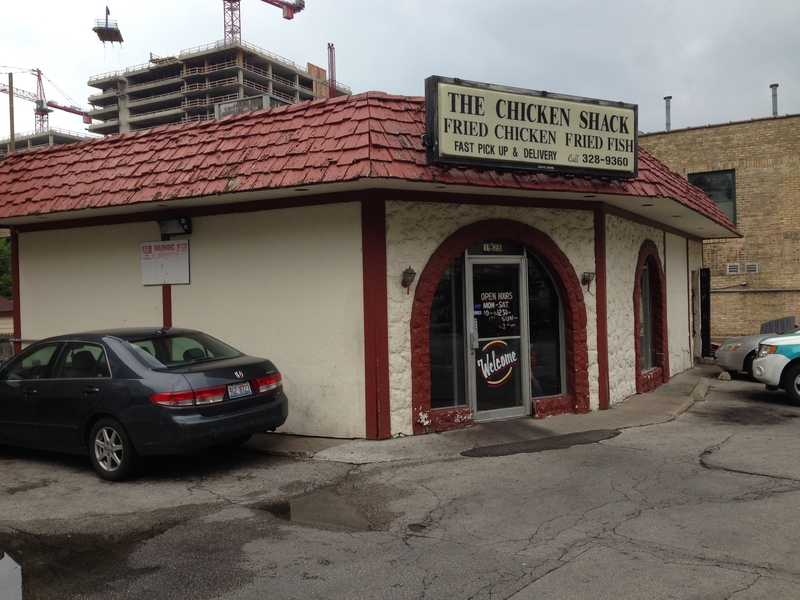 I can see why Chicken Shack is a great option for fried chicken in Evanston given the surroundings, but it hasn’t captured my heart like my first love. Still, I highly recommend anyone to make the trip up to the Shack!